Eric Milton went with a gutsy “hunch” based on a reaction he got on Saturday and it paid big dividends for his No. 3 ranked Severna Park Falcons as they defeated the No. 4 Arundel Wildcats, 4-1 at Bernie Walter Field in Gambrills to win the War Part 4 and the Section 1 title in the Class 4A East Region Tuesday afternoon. It was the third win in four games this season for the Falcons (19-3) over the Wildcats (18-5), including the Anne Arundel County Championship game by 12-9 last week. The Falcons will go after a repeat region title and their third in four years against Leonardtown, the Section II winner on Friday. The two teams are tied record-wise and the site will be determined by a coin flip today as will the 2A South location between No. 5 Marriotts Ridge and La Plata. With senior ace right-hander Cameron Clark, who notched his seventh win, having reached his limit of 105 pitches thrown per the State pitch count rule, Coach Milton went out to the mound and removed Clark for junior lefty Logan Harris. Harris claimed afterwards that he had not pitched in a game all season, while Milton said he had pitched just two innings. Regardless, it was an odd decision going to a seldom used underclassman in a pressure situation. Harris walked the first batter he faced with a runner on second, two outs and a three-run lead. He then coaxed senior leadoff man Matt Hagemann to sky to center for the final out. In the bottom of the seventh, Harris plucked Garrett Stanard with a pitch to start things but No. 3 hitter Moises Aristy hit a sharp grounder to third that senior catalyst Kody Milton smoothly handled and got rid of in starting a 5-4-3 double-play. With two outs, cleanup batter and junior centerfielder Noel Aristy, Moises’ brother, stroked a shot toward third that Milton took a step toward the bag and as he said “it took a funny hop on my other side and I went down to get it.” That he did and got up somehow with the ball, that was headed to left field and gunned down Aristy at first to end the game. 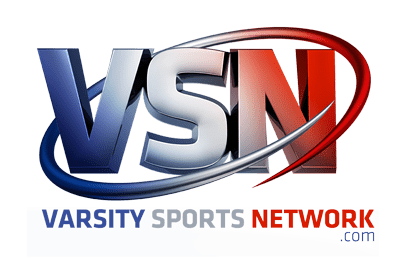 Winning pitcher Cameron Clark — Logan Harris – SAVE! 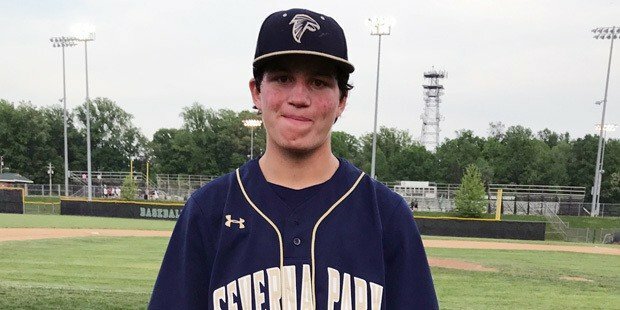 Severna Park set a County and playoff record with seven dingers to outlast Old Mill, 13-12, in 8 innings on Saturday. Milton got Harris up a couple times during the donnybrook to get ready, but the 6-foot-3, 185 pound southpaw couldn’t break out of the bullpen and he obviously showed his dismay to the coach afterwards. Here late in the season, Coach Milton had been going to his University of Maryland-bound son, Kody to close out games and Kody threw two pitches too many on Saturday and couldn’t be used. Milton figured in the two runs that the Falcons got in the first inning off Arundel starter and senior ace Will Schubert who would go six innings on 97 pitches. Milton singled in Cameron Clark’s courtesy runner, Garrett Weiss with one out. Clark had drawn a base on balls. Catcher George Lesher’s sacrifice fly later scored Milton for a 2-0 lead. Arundel scored its only run off Clark in the bottom of the first as Garrett Stanard, who walked with one out, later raced home on a throwing error. Clark would then strand nine runners over the next five innings, including the bases loaded with two outs in the fourth. Clark’s line was 5.2 innings, 97 pitches, four hits, four strikeouts and four walks – two walks in the bases loaded fourth. Starting pitcher Cameron Clark held Arundel in check for 5.2 innings and earned the win. The following inning Clark prevented the Cats from getting something going when he pounced on Stanard’s bunt leading off the frame and he fired a strike to first baseman Luke Guy to nip Stanard by a whisker. 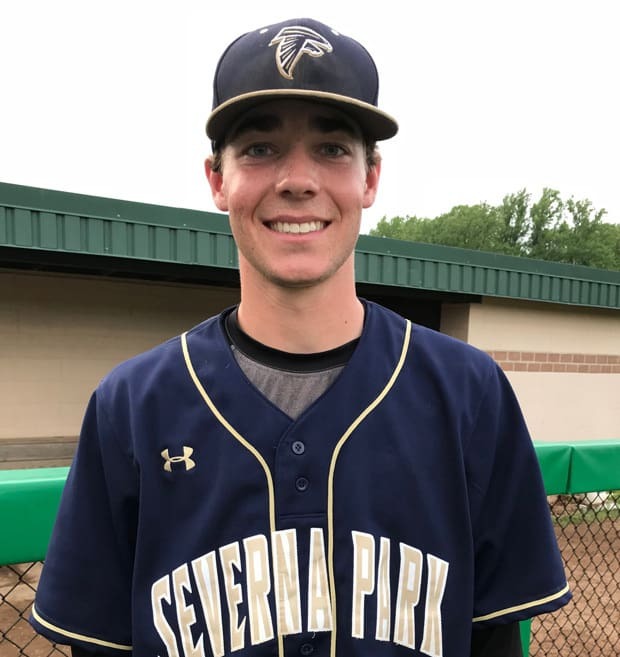 Severna Park rallied for two huge runs in the top of the sixth against Schubert, who gave up three of his eight hits in that crucial inning. Schubert only struck out one batter and walked two, but couldn’t hold off the Falcons in the sixth. Guy singled in a run and later scored on a wild pitch for a commanding 4-1 lead and ultimately the final score. Neither Clark and Harris nor Schubert and Moises Aristy, who pitched an uneventful seventh inning, gave up an extra base hit. The victory meant a lot to the Falcons especially Clark, Milton and the other seniors. Coach Milton is really proud of what his guys have accomplished this season, but it’s not over yet. “Our goal is to win a state championship,” the coach has mentioned several times this season. Don’t know if the coach has “a hunch” that they will. Pictured above: Severna Park’s Logan Harris was called on in relief for the first time this season, as Coach Eric Hilton played a hunch, and the junior lefty delivered a save for the Falcons. A – Will Schubert, Moises Aristy (7) and EJ Santana.